The quad buffer board takes one of the four of the universe header outputs from any of my controllers and converts the low voltage (3.3Vdc) logic to differential 5.0Vdc RS-422/485. The output buffer is bandwidth limited to 2MHz, which extends the possible length of the wiring and reduces the possibility of radio frequency (RF) noise. The buffer supports either three or four wire pixels per Ethernet connector. The four wire pixel type supported is WS2801, which has a clock and data line. If the output type is for a three wire pixel, which only requires one signal line, then you can send two outputs/universes over a single Ethernet cable. The jumpers on the board are labeled either two/four output, move the jumpers to two for dual outputs. When in this mode only output jacks 1 and 3 are used. The board also supports being used for pixel extenders. The output 3.3Vdc pixel data is converted to RS-485, where it can be sent a long distance to the receiver board. The receiver card is used to convert the RS-485 signals to the 5.0Vdc CMOS singled ended signals required by the smart pixel strings. 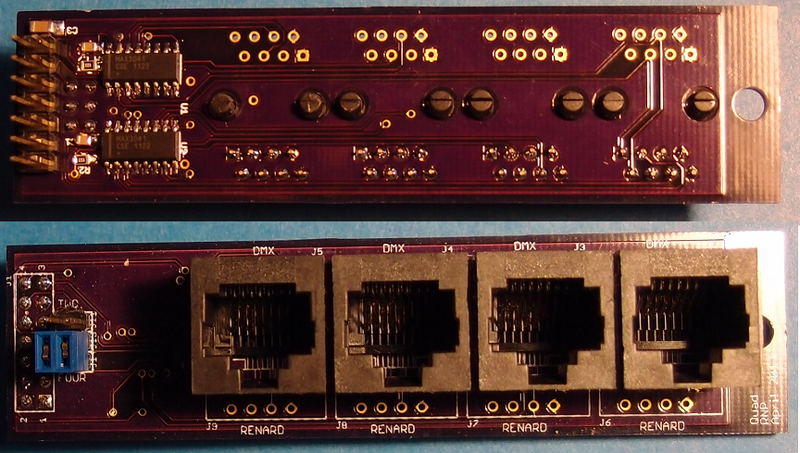 The DMX and Renard control modules do not need the receiver card. This card supports the reception of two RS-485 signals, which can either be clock and data for WS2801 type pixels or two outputs/universes for WS2811 type pixels. This module also will accept power from either 5V or 12V pixel strings. The power can come from the string or the input power connector. There is an internal power supply that regulates the input power for the receivers. Note, that most of the 12Vdc strings data inputs are driven 5.0Vdc logic. The pixels that have 5V CMOS input levels are WS2801, WS2811, WS2812, TM1803, TM1804, TM1809, TM1829. The data sheets for TLS3001 and TLS3005 do not specify their input voltage levels. However, the TLS3001 indicates that the maximum input voltage is 3.3Vdc. Also, the TLS3005 says that the output voltage is 3.3Vdc, so it appears that these devices should be driven at 3.3V.